Every culture on this planet have known the Mother Goddess who brought forth everything that exists. Most important was her manifestation of Nature, because we are all very well connected with Nature. Or at least that used to be. 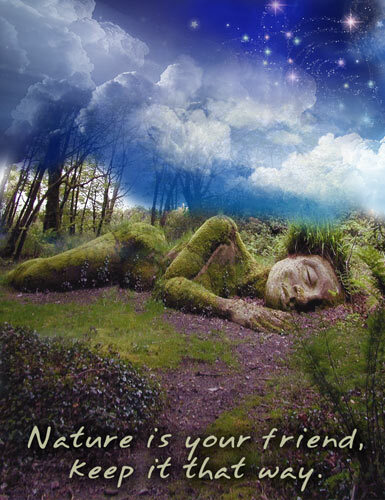 In past times, people understood that we we are part of Nature and cannot exist without her. Our physical bodies are made from what we eat and drink. Food and water come straight from Nature. Therefore we have to understand the harmony and the processes that exists in Nature. The soil in which the plants grow must have a balance in nutrients, microscopic biological life forms, and beneficial earth energies of various kinds. Modern man has depleted the soil of nutrients by monoculture, and poisoned it with artificial fertilizers and pesticides. The biological balance has been deeply disturbed, and he has no knowledge of earth energies. I once met a strawberry farmer who had a long line running through his field where the strawberry plants would only grow half as big, and not being healthy. He did everything possible to improve the soil. He even removed the soil and put new healthy soil in its place. Nothing worked. If he had know about noxious earth energy lines, he could have neutralized or transformed this line. Earth energies cannot be underestimated because they have far more profound effects on Nature and by extension, human beings. The entire earth has an energy grid that was put into place in the very beginning of planet earth by cosmic beings who wanted this planet to be conducive to the development of intelligent beings. Some people are quite familiar with this energy grid (and some other lesser grids), but don’t realize the full extent of it. This major energy grid is a geometric structure that transforms cosmic energy into various other kinds of energies that are necessary for the manifestation of life forms on earth, of all kinds, from rocks, crystals, plants, animals to people. It provides information and consciousness which allow the life forms to develop. What we see here on earth as Nature is the manifestation of all the energy grids, which are also connected with various and numerous other energy structures. It is therefore important that you know at least what energy lines run through your property and house (a dowsers can find that out), and if and where there are traditional energy places, like megalithic monuments and stones, or other ‘sacred’ places that previous cultures were honoring. As over the past millennia, various rulers in diverse cultures have used major energy lines and places for their own nefarious purposes. This has resulted in the distortion of certain energy lines, energy vortexes and other energy structures, which has resulted in the negative control of the life energy on this planet, in particular of their human subjects. It is known that the Catholic Church took possession of the ancient sacred sites of the peoples they conquered, but other religions, and governmental rulers have done the same. It is time to clear out these suppressed energy sites. Not only the earth has energy systems but the human body has them as well. Nature is like a spider web, connecting all systems together. Our human energy body is directly plugged into our environment, that is, the energies of the ground, the energies running through the landscape and the cosmic energies coming down from the universe. Our present global society has become a dangerous one as we see a continuous trend to estrange man from Nature, but also from his own bodily energy systems. Our food supply is now in the hands of large corporations, which are now also privatizing drinking water supplies. Our clothing has moved from natural to synthetic fibers. Our houses have been and are still built without any knowledge of noxious energy lines. When I now walk through the town I live in, I constantly see people talking in their cell phones, looking at their smart phones or ipads, or being engaged with their laptops while drinking coffee. They cross the road without looking, on their cellphone. They are chatting away on their cellphone, while their kids are trailing behind, having lost that important connection with mommy or daddy. A large percentage of traffic accidents is now due to the use of their cellphones or texting. The primary reason why people use their cellphone (yes even in the bathroom) is boredom. What I see happening is that people are retreating in a psychic space; they are not connected anymore with their immediate environment. I see people sitting near a beautiful stream with waterfall, focused on their cellphone or ipad. They are unable, or unwilling, to connect with nature anymore. All this is having its impact on their health, psychological and physical. This is not new, but it is getting worse. We need to consciously connect with Nature, because Nature not only feeds us but provides the balance and harmony we need to live a healthy life. You can find a lot of information on the web of what is wrong with our society, but it is time to also start improving your own life, in all the facets that are necessary for a human being. People have forgotten what it means to be a human being. This starts with understanding our place in Nature. This entry was posted in Awareness, Consciousness, earth energies, healing, ley lines and tagged body, consciousness, cosmic, energies, energy, envirnment, grid Earth, life, nature, spiritual. Bookmark the permalink.